Hittin' up Chopt today for lunch? We hope you like dead rats in your food. 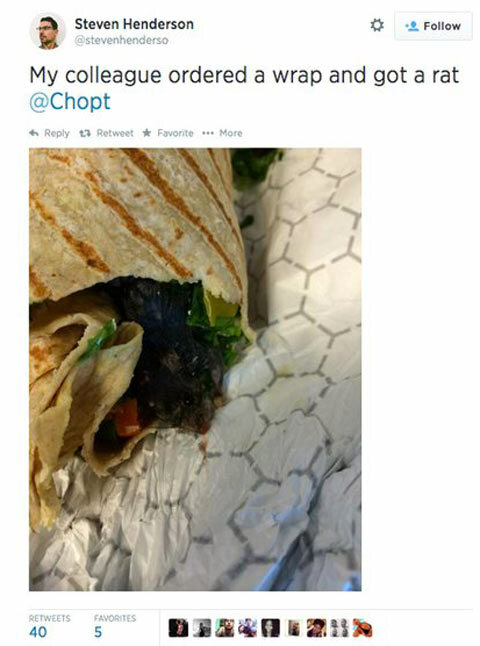 The Twitter pictures that surfaced yesterday of a rodent peeping out of a wrap at Chop’t were no joke. It stared when a Stroock law firm employee heard his coworker scream. His unlucky coworker had bitten into a wrap that had a dead rodent stuffed tightly inside. Another witness/coworker, Steven Henderson, bravely stepped forward to investigate the wrap after it was tossed aside, and took the revealing photo (displayed below). The Chop’t branch, located at Pine Street in NYC’s Financial District, did refund the distressed customer the purchase money, and the founders of Chop’t even called to apologize to the victim. According to Gothamist, the Chop’t folks “expressed that it must have been a disgruntled employee” who did this. The Chop’t founders also expressed their sincerest apologies in an open letter yesterday. In it they assure everyone that all their locations receive very routine inspections by the Department of Health, and regularly enlist the help of a restaurant sanitation audit company to keep cleanliness in check. Even though their Pine Street location holds an A rating from the Health Department, it underwent another thorough inspection yesterday, and is now again open for business. Let us pray this never happens again. Meanwhile, feel free to look at this NYC rat map, which shows the percentage of rodent-infested restaurants by neighborhood.